Umpqua Lighthouse is a lovely coastal spot to visit or at which to become a volunteer lighthouse host. This lighthouse offers many recreational options just outside your RV door. 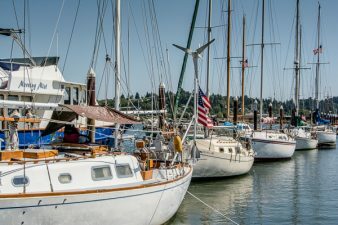 The diverse surroundings include Umpqua Lighthouse State Park, Lake Marie, the Marina at Salmon Harbor on Winchester Bay and ATV trails in the Oregon Dunes Recreation Area. 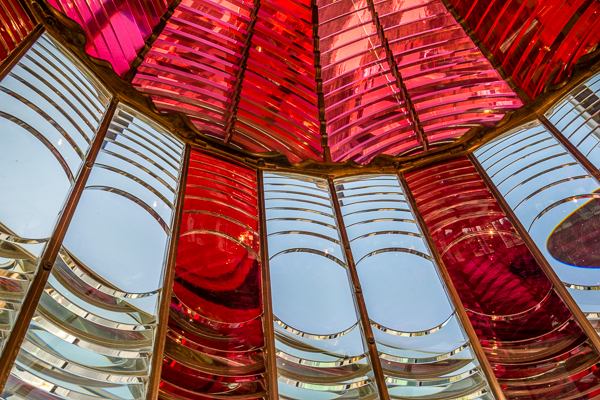 We luck up with a guided tour by Susie to see the beautiful red and white fresnel lens in the lighthouse tower. Susie’s presentation is informative and she manages to teach Storm and me a thing or two about hosting a lighthouse tour. We will use some of her info to answer questions at our lighthouse – Thanks, Susie! Umpqua Lighthouse is operated by Douglas County Parks Department and if you are interested in volunteering here you should call them at (541) 271-4631 for application details. By the time we leave the lighthouse we are starving but all the nearby marina restaurants are closed. There is only one logical solution to our problem. Dashing into the dockside bakery before it closes too, we purchase one slice of pumpkin creme glazed cake and one of carrot, walnut, coconut cake. Now possessing the strength to continue our journey, we drive south to Coos Bay. 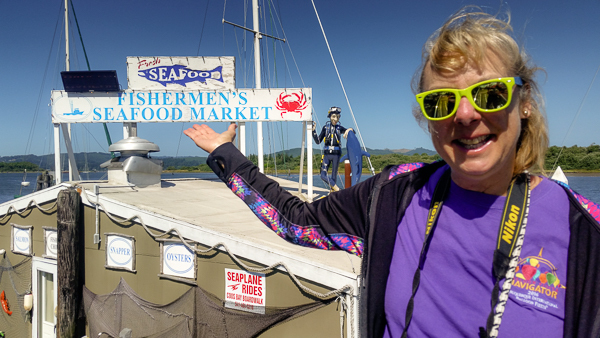 Here we finally stumble across Fisherman’s Seafood market on the wharf for the seafood lunch (now early dinner) we are craving. The owner serves up travel advice and huge, juicy fried oysters both of which we devour with glee. Earlier this month on the way to our weekend stay in Bandon we were dumbfounded to see parties of people wandering around downtown Coos Bay with empty wine glasses in their hands. We have been planning to research that phenomenon so we stop at the Coos Bay Visitor Center after our meal. We learn that on the first Friday night of each summer month in Coos Bay they offer a Wine Walk. All we have to do is purchase a glass, then walk around town tasting wine. Wine and exercise – what a perfect combination – in moderation for both of course! OK this is getting weird. Her hands are shaking so badly that she can hardly scroll through the pictures on her phone. When she is finally able to present to me a picture of her friend Sunny and she is RIGHT! Sunny does look almost exactly like me except maybe 10 or 15 years younger (I will accept that compliment -thank you Ma’am!). Thank goodness Sun is married to Jim and not someone named Stormy or this whole episode would have been a little too surreal. why are the signs blanked out? I was using this video to practice techniques I haven’t used before. Blurring signs was one of them. You have a doppelgänger! Ha, always wanted to use that word. Wish I could have seen the picture to compare! I love that word. Thank you so much for using it on my blog :-)!!! It was amazing – I should have gotten her to email the picture to me. I will try to remember that next time this happens. I am grateful to those who, by their opposition, often help me to remain true to myself.